ART CLASH WEEK 4: BATMAN IN THE SNOW!!! › Forums › THE ART CLASH 2.0 › ART CLASH WEEK 4: BATMAN IN THE SNOW!!! Whose Batman in the Snow freezes out the competition? This topic contains 24 replies, has 6 voices, and was last updated by Newbold 2 months, 2 weeks ago. 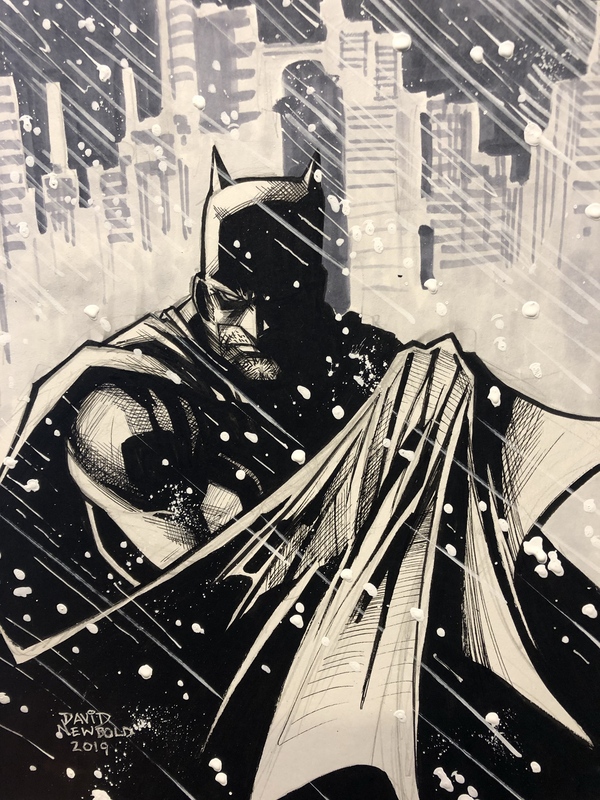 SUBJECT: BATMAN IN THE SNOW. CONCEPT: We’re still not tired of the snow, so we’re going with an old favorite–Batman in the snow. Draw any version of Batman you’d like, but he has to be in the snow. (***NOTE: I understand we’re a little behind on the deadline, so we’ll give a little extra time, maybe a day or so, to get your piece done. ***) Good luck! Russian Batman from Superman: Red Son! Scott! Great to have you back…and posting first. Wow. I thought Steel would always occupy that slot each week. 😉 And I’m really glad to see you pushing your shot and anatomy. Great job! Interestingly, this ties in directly to something I’m trying in my own work and likely will be for the the foreseeable future. Here’s some process pencils, if anyone’s interested. Dave has really inspired me to start working on paper again. As I don’t have a pencil that can accomplish fully what my Photoshop rough-in brush does, I just went for a very gestural tube/wire-frame shot that allowed me to block everything in generally. With the above, I just went to pencils. I just used the PaperMate Sharpwriter pencils here for this part. I read somewhere a long time ago that Marc Silvestri uses them, so I gave them a shot. They work perfectly. I love them…which is disappointing, considering how much I’ve spent on expensive/”professional” pencils. AWESOME, Newbold! I’m glad you could make it. I’ll give it a bit to see if Daniel shows up, then I’ll set up the vote for this afternoon. I couldn’t do it this week. Pretty busy designing some banners for a customer. Next week I’ll be back! I voted for Scott! But everyone did a great job! Hard to choose one, really. Sorry you couldn’t make it this week, Daniel. But we’ll look for you to come roaring back this week! It seems that Brett won… what’s next??? Thanks for the votes, folks! I really appreciate it. nice work people and good win Brett. Aquaman in the ice? Conan in the snow? maybe next week…..
Looks good David, if you finish it post it here so we can see it. I would love to do a Conan piece of art! In the snow or otherwise. David, was that Batman vs Freeze? It looks cool, but I actually liked the piece you went with more, i think. I really like the face, the hatching/ink work and that you spilt the piece in to planes. I really liked it. Which reminds me…I’ve still got to do some critiques. I’ll try to get to that, maybe tomorrow. (deleted) I hit the wrong reply button … again! I’d thought about it. Ha ha. I actually considered an arctic water scene. But I thought it could be a more formative challenge to try and redefine Aquaman as a character on the same level as Batman, Superman and Wonder Woman…but without changing the costume…maybe just through attitude. I’d considered having him lifting a boat, but couldn’t get the composition to work. Scott – I love the inking and tones. I also think figure construction (with one minor point) and movement is spot-on. There’s a weight to these figures, especially Batman that really works. I’m also really impressed with the expressiveness you brought to this piece. For the figure work, this is one of my favorites of yours. There are a couple minor tweaks I’d recommend. First, Batman’s left upper arm is too long. Measure your own arm to see where your elbow comes…even when throwing a massive uppercut. I always recommend using body points to cross reference and compare, just to keep everything in proportion. Also, I know you had been working with trying to move his left leg forward. If you’re wanting to exaggerate the foreshortening, I’d recommend lengthening the lower leg (the segment of the leg closest to the viewer), or exaggerating its length more than the thigh. I think everything else with the figures is great. I’d recommend doing something more to the background, though. First, I think you need to keep Batman’s feet disconnected from the buildings in the back. He’s in the air and nothing says “in the air” more than having the figure disconnected from gutters, edge of the page and the background structures. I think this is a great step forward for you, Scott. Great job! Steel – This a great iconic pose! I really like your composition. Look at how you keep the image weighted, with the building on the right and lower right sides of the frame. This does a great job of offering contrast with the sky and does a FANTASTIC job of framing Batman. FANTASTIC WORK! In terms of areas of opportunity for improvement, I think you can start working more on simple anatomy. I believe you’d help yourself by doing more in the actual drawing phase and NOT moving on inks, and certainly not colors, so quickly. I think you need to nail down some of the basics of the figure and cloth, like the cape, for instance. I can’t emphasize how important this is at this phase in your growth. This becomes even more apparent in the line work for the gargoyle, where instead of lines demonstrating forms, there just seems to be a lot of random lines with no reason. Also, try to find reference for your things. I DO NOT think it’s a good idea to chain yourself to reference, to have to use it for everything. But I do think it’s a good idea to draw costumes accurately, or maybe to get an idea of how a gargoyle works and attaches to a building. I think it would help a lot. All this said, I’m really impressed with your growth, Steel. But it’s time to start guiding your growth in a more disciplined, informed, way…THEN you’ll be free to break the rules and take your art in whatever direction you’d like! Knight – For a very rough piece, I like where you’ve started this. I think this is a pretty decent pose and you did a great job framing Batman’s head with the composition of the building in the background. That said, if Batman’s head (or whatever you choose to guide the viewer’s eye to) is a focal point , it HAS to be really solid. 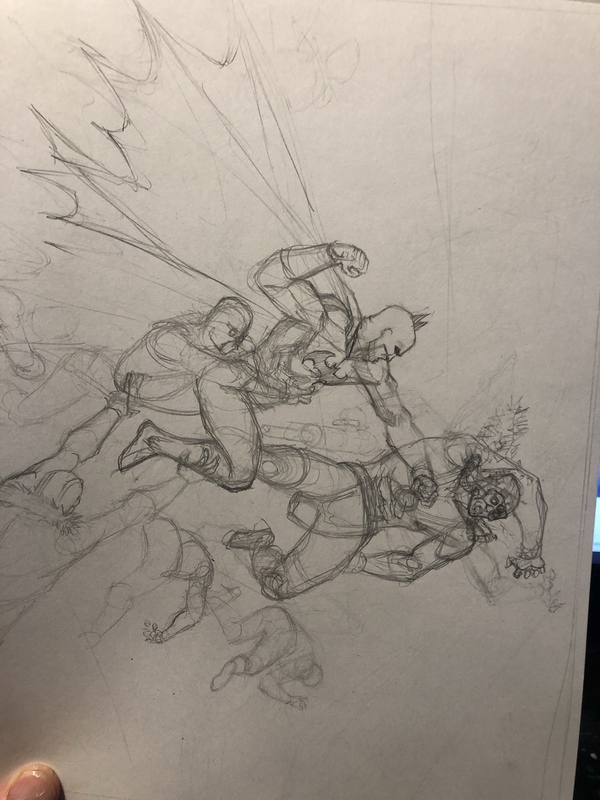 I know you were trying to strip down your work this time and that we are working on posing, figure work and detail, but that doesn’t mean you don’t need to put time and effort in to getting the details right(anatomy/perspective/light and shadow). Again, I think this is a good start. Let’s work on taking the next Art Clash even further! David – I really like the piece you submitted. As I mentioned above, I like the separation of planes and how you used grays to push the background back. I like the face and I like the hatching on the face. You did a great job of focusing the eye on the face. I know this piece was a little more rushed than you would have liked, but I feels a little looser than the Batman vs Freeze piece you’d been working on. And I think it works a little better. I think the proportions of the first piece feel a little more superheroic…maybe that’s it. I’d be curious to know how you rough/gesture out the figures when you begin a piece. If it would interest you, something that works for me, in terms of keeping a sort of looseness in the figure work, is to use a carpenter pencil, or rectangular drawing pencil, something not too dark (maybe 2B at most) and just gesture in the forms (not anatomy or detail in any way–just general blocks for where things go). I used to just go straight to trying to do general anatomy and figure work, but this has really helped me keep my forms a little more fluid and it seems to encourage superheroic-style exaggeration (thought I’m trying to push it more), because I’m not worried about figuring out anatomy when I’m doing layouts. It keeps everything in its place and takes the stress off of trying to figure everything out at once, I guess. Just a thought. That’s all for this week. I’m looking forward to seeing what you guys come up with next week! Thanks for the critique, Brett! There is a lot of stuff wrong with this for sure. Too much to easily fix. I find it strangely okay as it is, though. When can I see a do this/don’t do that type tutorial on those scritchy halftone lines that seem to work but I can’t quite figure out how. You should make a draw off challenge where each of us gets asked to make a how-to page from something someone else is asking! Then you could add it to your tutorial section. 2 birds, one stone. thanks for the critique Brett!! I’m going to incorporate your methods into the next couple art challenge pics and see where it takes me. i’ll try to remember and post gestures. I am probably a little to tightened up in the gesture stage.